I know the “Big Game” usually involves dips and beer but in this house we like our mixed cocktails. 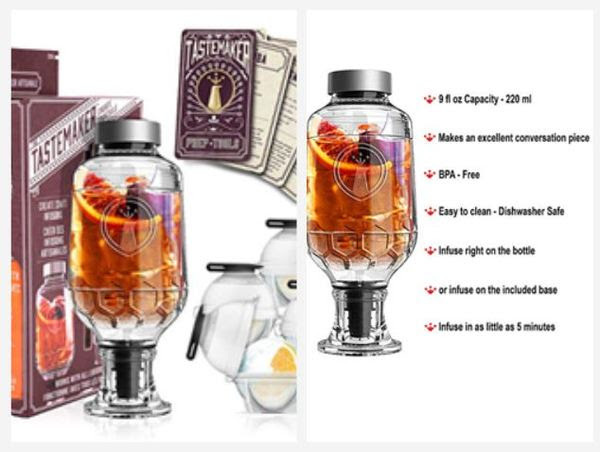 I am super excited to be trying out my new Tastemaker Complete Cocktail Infusing Set. Sound complicated? I know.. I hear you but I am telling you it is so easy! Grab your base alcohol (think vodka, tequila, whiskey, gin, rum, even wine) and then you add fruits, herbs, candy and shake to infuse. The best part is that you can choose to infuse for 5 minutes or even let your concoction infuse for a day! Sky is the limit and you are your own bartender. I chose to try out one of the cool recipe cards that came with the Tastemaker. I tried “Candied Vodka”; your favorite candy (skittles, starburst for me) and vodka. Let the mixture infuse for 15 minutes and serve on the rocks or in shots. More recipes and information on their website. This item will cost you around $24.99 and is a bar accessory must! You are basically your own “part-time alchemist” now! Hope your team wins!